Dapper Shoes have a simple mission: to create a truly eternal shoe, one that never go out of style. Each finished shoe is the result of an international collaboration of shoemaking experts, from master craftsmen in India to fashion-savvy Italian designers. Utilizing exquisite full-grain leathers sourced from the finest materials Europe has to offer, They design their shoes to be comfortable, wearable, and fashionable — yet built to outlive any trend. A young brand, Dapper wanted to carve a niche in India’s price-sensitive market, while establishing itself as a strong player in a highly competitive environment. With confidence in the quality of their products, creating awareness was their primary objective, while driving sales was the definitive goal. Facebook was identified as the ideal channel to reach a custom target audience of urban and sub-urban dwellers with disposable incomes. A phase-wise approach led to a structured recognition for Dapper, insisting on branding at first, and then gradually optimizing for website conversions. Each phase concentrated on various targeting techniques identifying the best drivers, all while maintaining a healthy Cost per Transaction. Different ad types on Facebook allowed us to reach particular cohorts. Once the target audience had been captivated, OnlineSales.ai went on to experiment with ad messages for each of them. Lookalike, custom and interest-bucket targeting tactics were then incorporated on Facebook, exciting buyers with intent-driving ad copies clubbed with visually attractive creatives. OnlineSales.ai also segmented campaigns at device and placement levels, to help achieve Cost per Transaction goals. All of these witnessed a sudden surge in click-through rates, and consecutively, growth in conversion volumes. 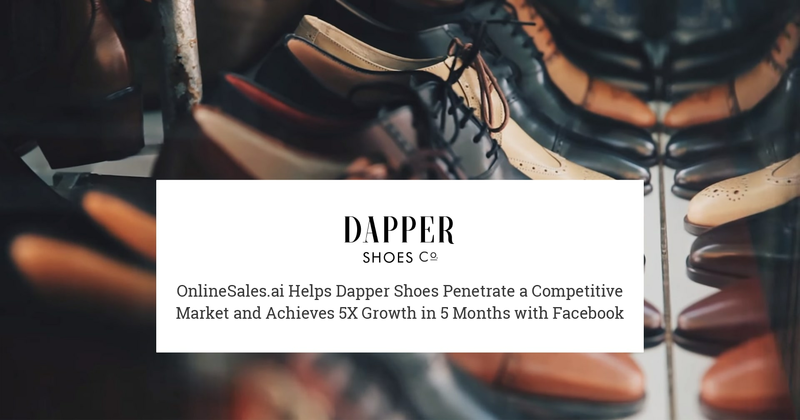 OnlineSales.ai for eCommerce – the homegrown, award-winning OnlineSales.ai platform features were used extensively throughout the performance marketing activities hand-in-hand with Facebook’s powerful toolkit capabilities, ensuring an engaged end-customer time and again. "We sell a vast variety of shoes and running effective ad campaigns for our entire product line across multiple channels was posing to be a problem much beyond the scope of our small in-house marketing team. This is when we decided to try OnlineSales.ai for eCommerce, and we’re really happy with our decision. OnlineSales.ai integrated directly with our website’s catalog and made it super easy for our team to manage our product feed and ad campaigns across channels. With OnlineSales.ai in control of our performance marketing automation, we’ve seen an unprecedented growth of 4 to 5X in RoAS in the last 5 months. Their account management team has been super supportive in ensuring we make the most of the platform"
Interested in Learning How You Can Drive Better ROI?